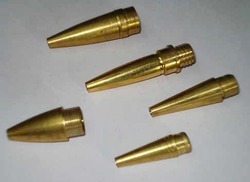 The high resistance to corrosion of these Brass Ball Pen Nozzles has helped us to get repeat orders for them. We are rated as a credible Manufacturer and Supplier of Brass Ball Pen Nozzle. These Defect-free Brass Ball Pen Nozzles are always acclaimed for their durability and come in varied sizes. We are engaged in offering an extensive range of Metal Parts For Writing Instruments. These Metal Parts for Writing Instruments are appreciated by large number of clients due to high quality and durability. By implementing latest technologies and advanced equipment, we are engaged in offering a wide range of Pen Parts. These Pen Parts are easy to fix without loosening. High quality, scratch free properties and long lasting service life. Available in different designs, these Pen Parts are offered at market-leading rates.